If you have open positions in different currencies (e.g. you own shares in UK and US listed companies), the total value of your open positions is based on the current Foreign Exchange rate. Therefore as the Foreign Exchange rate fluctuates and the value of your overseas investments fluctuate, you can quickly see at a glance what your return is in your base currency. The base currency in this example is British Pounds, however timetotrade also supports the use of Euro and US Dollar base currencies. As shown in the Open Positions section to the right, currently the Investment Club have positions in two UK companies and two US companies. The total value of the UK and US open positions on the day this information was captured was £7,078.08, based on the US Dollar / British Pound exchange rate applied to the value of the overseas investments at that point in time. The associated gross profit on the total UK and US open positions, based on the current exchange rate was £784.59, which was a return on investment of 12.47%. The change in the total value of the open positions for the displayed day was 1.43%, which factors in the difference between the value of the open positions at the end of the previous day and the current value of the open positions, including the difference in the exchange rate over the same period. The information used to determine the value of your investments and the associated returns is based on the information contained within your Ledgers in the Accounts section of timetotrade. The current unit value is displayed, which in this example is £1.13 and the current value of the units that you own, which in this example is £457.38. This information is taken from the 'uvs' tab in the Accounts section of timetotrade. In the last paragraph of the Welcome section, the total value of your subscriptions, less any withdrawals that you have made is displayed, which in this example is £400. The associated gross profit and return on investment relative to how much you have paid for the units that you currently own is also displayed, which in this example the gross profit is £57.38 and the return on investment is 14.35%. Lastly the daily change on the value of your units is displayed and in this example the value of your unit investment increased by 2.11% that day; the increase in the open position value is less than the increase in the investment return due to gearing through the use of margin. 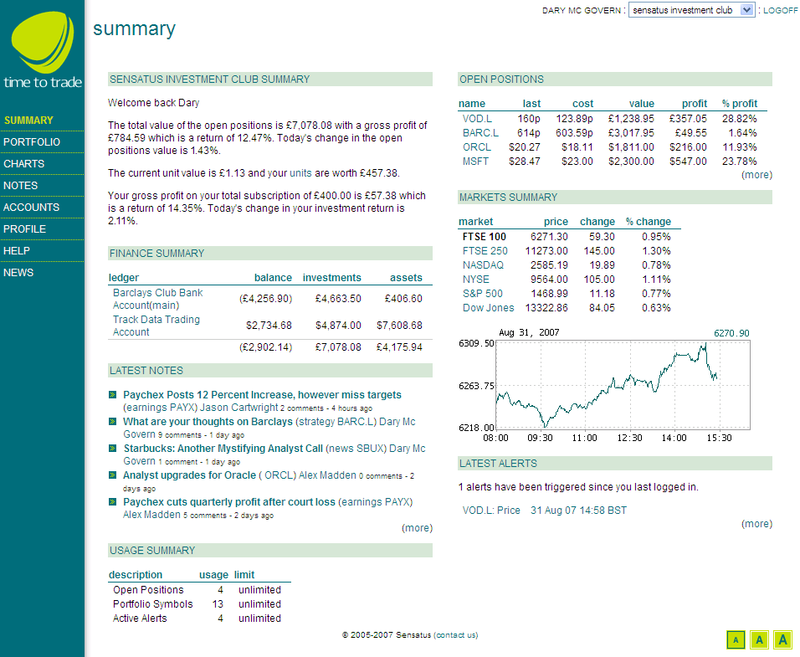 The Finance Summary provides a high level overview of your ledgers. The cash balance, investments value and total asset value for each ledger are displayed in their associated currency. The cash balance, investment value and asset value are then totalled using the current Foreign Exchange rate to provide the total value of the various fields in your base currency, which in this example is British Pounds. In this screen shot example there are two ledgers, one for Barclays and another for a US Trading account. If you click on the ledger names, that are highlighted in green text, you will navigate to income/expenditure section of the relevant ledger. As a general rule, if the writing is displayed in green against a white back ground, you can click on it to navigate to the relevant timetotrade tab. This section displays the five most recent notes that you or members of your investment club have commented on. The main title of the note is displayed in bold dark green and the associated tags and authors name are displayed in a normal dark green. If you click on the name of the note i.e. the bold dark green text, for example, "What are your thoughts on Barclays" in the above screen shot example, the full note will open in the Notes tab of timetotrade. This will enable you to read the full note and the associated comments that either you are other club members have made. If you click on one of the tags, such as the tags "strategy" or "BARC.L" that were used when creating the "What are your thoughts on Barclays" note, a list of all notes that have been tagged accordingly will be displayed. For example if you want to find all notes that you or members of your investment club have created for Barclays, click on the BARC.L EPIC symbol. If you click on the displayed authors name, all notes that have been created by that author will be displayed. The smaller font, comments and time stamp display how many comments have been added to a note and how long it has been since the last person added a comment. In the Barclays example, there has been a total of 9 comments and the most recent was 1 day ago. If you click on the (more) link at the bottom of the Latest Notes section, it will take you to the Notes tab. The open positions section provides an overview of your current investments. The ticker symbol for each investment, along with the last trade price, the average cost of purchase, the current value and corresponding gross profit and percentage gross profit is displayed. Each position is displayed in its native currency, so for example if you have UK and US investments, the last trade price and associated figures will be displayed in British pence and pounds or US dollars. Timetotrade also supports Euro investments. The last trade price and associated performance information is updated every 1 minute and is based on 15 to 30 minute delayed price data, depending on the exchange policy. If you click on the (more) link it will take you to the Ledges tab. This section provides an overview of some of the main UK and US markets. The value of the market is displayed in the price field and the corresponding daily change and percentage daily change is displayed in the associated fields. 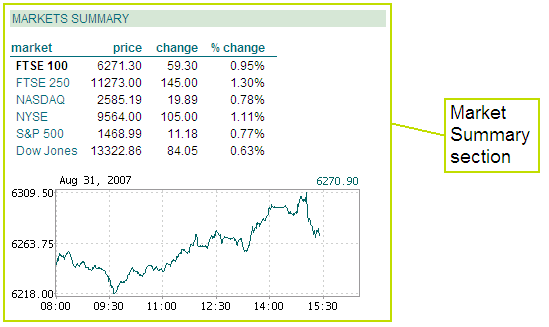 If you click on the market name highlighted in green, the associated intra-day market chart will be displayed below. If you then click on the displayed chart, you will be directed to the Chart tab, where the full charting and alerting functionality is available. The Latest Alerts section provide an overview of how many alerts have been triggered since you last logged in. If you click on the alert title e.g. "VOD.L: Price", it will take you to the charts for the associated symbol, were you can review the charts and alerts that have activated since you last logged in. If you click on the time stamp beside the alert description, the alert history for that selected alert will be displayed. Note that you can set up repeating alerts, and the history of each alert and the associated ticker symbol price will be displayed. If you click on the (more) link, it will display a summary of the active and paused alerts. This section provides a quick overview of usage statistics relating to various features in timetotrade. In this example, there are currently 4 open positions, 13 symbols in the portfolio tab watch list and 4 active alerts. Depending on the size of your screen and your eye sight, you may wish to change the size of the display area and the associated text. To do so click on the small, medium or large size A green buttons on the bottom right of the screen. On the top right hand side of the screen, your name will be displayed along with the option to quickly switch between packages that you are subscribed to. In the Profile section of timetotrade you have the flexibility to create multiple accounts using the one set of log in details to timetotrade. To do so, either add a new package to your existing log in details using the Profile tab, or ask a member of another club to invite you to their investment club. After you have set up multiple packages, you have access them using the drop down menu on the top right of the screen.